Meru joins the group sometime into disc 2 when they are on a quest to save an NPC from bandits, forcing them to take her with them because she's adamant on saving the person. 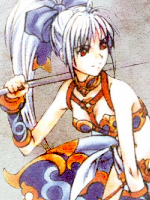 She introduces herself as a wandering dancer and is acknowledged as the holder of the Blue-Sea Dragoon Spirit by the end of the disc, but it is not until story events during disc 3 that she reveals her identity as a Wingly, a species believed to have gone extinct after the events of the Dragon Campaign. The Wingly settlement she belongs to is hidden deep in the forests of Mille Seseau, inaccessible by Humans. Meru is loud and upbeat, with plenty of energy to spare. Meru is the life of the party and her behaviour and interactions are often played for laughs, her interactions with Rose being no exception. When she first invites herself into the party, Rose flat-out says "Just leave her alone. Let's go. ", and when Dart allows her to tag along, Rose is not at all impressed: "Are you serious?" Meru and Rose aren't close, and the distance Rose initially keeps from the party is furthered in their case because Meru is quite intimidated by Rose, without having the slightest clue as to how to approach her. Unlike Shana, who spends the first part of the journey feeling personally inferior to Rose, I think that Rose's aloofness unsettles Meru as someone who tries to understand and learn more about Humans. Meru may just be the most sociable person in the group, and generally has an easy time getting close to others and making them feel natural and comfortable, but here's a person who she just can't figure out. When speaking of Rose's attitude towards Meru on the first two discs, I think the awkwardness of their relationship tends to get exaggerated - understandably so, if you look at Rose's various lines in isolation: "I don't think you're gonna have 'fun' from now on." (in response to Meru's excitement and thirst for adventure), "I can't blame you for feeling scared." (when they hear the cry of a Dragon), or even "Oh, I am surprised that Meru was recognized." All of these can be read as anything ranging from teasing to sarcasm to condescendence, though it is most likely the middle-ground of sarcasm if you ask me, given Rose's personality. But that's all there is to it, I think: Rose's no-nonsense attitude extends to everyone, and it's perhaps most noticeable around Meru because Meru is part of the group (unlike NPCs), and because she is the way she is (unlike her party members, who don't talk as much) – I wouldn't confuse it with personal disapproval or dislike. Meru: Exactly!! Can we hang out together? Rose: If you want to practice your sword, I can give you one. Meru: Um... Ah.... I think I'll hang out by myself. Rose: Okay. It's unfortunate though. Rose turns back to Meru. Rose: I can give you some practice if you want. Meru: No thanks! No thanks! I'll behave!! Dart: She is strange, but I don't think she is as strange as you. Dart: Have you told us everything about you, Meru? Dart: Don't talk bad about your friends. Everybody has something that they need to hide. As is the case with Rose, Meru can't really explain why she feels that she needs to come along, yet can't resist the pull; when Albert asks her about it on the Queen Fury, she merely responds with: "Um... Let me see. I dunno why but I really feel that way. It's true. But, I dunno what it is." Similarities between the two characters may never be brought up in the game (mentioned again below), but it's striking that both Rose and Meru temporarily leave the group one after another while the group is journeying through the Evergreen Forest on disc 3, both claiming that they have errands to do without elaborating. Rose revisits Neet, while Meru returns to the Forest of Winglies for the first time since setting off to see the world. If Meru is aware of Rose having secrets, so is Rose of Meru: Rose startles Meru on disc 3 when she speaks of the Winglies' sealed ancient weapons, the Dragon Buster and the Dragon Block Staff, and perhaps for the first time, Rose addresses Meru, the Wingly, directly: "Actually, it seems that one of us knew about it. Meru?" Rose wouldn't have drawn attention to Meru's knowledge of the Winglies if it hadn't been for the dire situation, the threat of the fiercest Dragon of all; more importantly, Rose doesn't divulge Meru's identity at that point even though it's clear between the two that Rose knows. She leaves it up to Meru to reveal herself as a Wingly later on – and Meru's first worry concerns the way her newly-found friends perceive her: "Would you believe me? Would you consider me as a friend if I told you guys?" Rose clearly limiting the information she offers to what is necessary and thus not giving away Meru's secret merits mentioning not just because of the Black Monster/Wingly identities parallel, which makes them afraid of the group's reaction were they to find out. The truth goes deeper than that: Rose and Meru are both remainders of the old world – Rose as a survivor of the war, Meru as a descendant of the former ruling species. It's never stated how old Meru actually is and how her age translates to Human age (whether or not Winglies are naturally immortal is discussed here), though judging from her outlook in the game and the lack of personal accounts of the past, I doubt that Meru hails from that time, but that she was born much later on. Nevertheless, Meru, as a Wingly, carries the legacy of the old Wingly regime and is still affected by it, even if those times have turned into legends – stories – in the Humans' present age and memory. The Winglies of the settlement Meru is from most are most likely descendants (rather than survivors) of those who have retreated and closed themselves off after the war. Although their magic has drastically declined, they still draw a clear line between them and Humans, some of them outright hating Humans. They mean to protect their own life, and their mentality is coloured by fear – fear that Humans will do onto them as the Winglies have done onto Humans in the past, because their magic power separates them from Humans. Leaving the forest is a taboo, and those who break the rule become outcasts. When Meru returns to the settlement on disc 3, she is met with relentless scorn and distrust, is no longer accepted as one of theirs (not even by her own parents), and forbidden to return. Albert: We are standing at the legendary place where Humans began their liberation. I wonder if it is an abominable place as well? Meru: You think too much. It's the same as Kadessa, isn't it? When you drag the past around, you cannot walk anywhere. Albert: It is true, Meru. The Forbidden Land that was the royal capital of the Winglies. And this Vellweb is a mere historic ruin. Dart: Yes. We can do nothing but settle for the present. Meru is among the most impressive characters in the game when it comes to willpower and conviction, and she, more than any other character, strives for the future. Meru doesn't blindly submit to the Winglies' taboos and doesn't care about upholding and living by the rules of the past; what she deeply cares for is the world outside of self-set boundaries, making friends, learning new things, and the friendship between the races. When Meru goes through Savan's trial in Aglis, she is faced with both her legacy as a Wingly and her own way of handling it: Another Wingly's sister admired Meru, and, influenced by her words, left the forest, only to be killed by a Human. Although Meru is blamed for it, her answer is "I still cannot die! I cannot do anything if I die! Even make amends!" – and though it may be similar to Miranda's, it carries a different meaning: Unlike Miranda, who has to realize that there's no value in being willing to die at any time and that she has to see the mission through to the end, I think that Meru's answer goes beyond purely personal reasons. She is the representative of the Winglies, and as such, she has to stay alive so as to actively shape the future – on behalf of the Winglies who remain, and on behalf of the Humans who suffered under their former reign. The most important thing? Meru fiercely loves humans – it's what her final personal battle in the last dungeon is about. Meru loves them for the qualities that they possess, qualities that the Winglies lack or have lost, for the way they help each other – but especially for their hopes and dreams, their future. Rose and Meru both lack(ed) futures in a way: Rose is bound to her mission and continues living solely because of it, whereas Meru, had she not left the forest, would forever be confined to the mindset of surviving Winglies. But while Meru never so much as hesitates to proclaim her love for Humans, I'm not so sure whether Rose still harbours any love for them. Meru's relationship with Rose is the one relationship I wish had received more personal moments due to their histories, precisely because it'd combine personal and historical aspects and would thus fit into The Legend of Dragoon's themes. Even with the reign of the Winglies lying in the far past and the Dragon Campaign being long over, Rose and Meru are both still struggling with the consequences of that time, whether it concerns their mission or them as persons, seeing how they are both shunned by their own species for what they feel they must do. Both of them are fighting for progress in their own way, and take responsibility for what has transpired. The main difference lies in their perspectives: Rose is anchored to the past and fights to preserve, whereas Meru looks to the future and fights for change. To preserve, Rose has no need for the cooperation of Humans – whereas to change, you do. It would have been interesting to explore all that in the game, and have Rose reach out to Meru more, especially when you consider Rose being friends with Ulara's Winglies. Rose: You are coming too? Meru: Of course! Without me, the strongest of all, you cannot save the world! Besides, I learn a lot following Dart. Everybody's the same, Gigantos, Humans and Winglies. And I can't stand the destruction of a world where everybody lives! Rose: I think for the first time, I agree with Meru.